When Kevin pulled up to the driveway, I couldn’t believe my eyes. Was expecting something small like a Nissan Leaf. Instead, I was looking at a cross between a silver DeLorean (complete with gull wings) and the Batmobile. Kevin’s the Team Leader of Illuminati Motor Works, and this was “Seven,” the electric car he and six other team members had spent the past three years building to compete for a $5 million prize at the Progressive Insurance Automotive X PRIZE competition. In June, their homemade, 4 seat, 3155 pound electric vehicle achieved 182 MPGe on a 134-mile run at Michigan International Speedway. Talk about American ingenuity. So we loaded up the trike, picked up team member, George, and hit the road for Champaign. 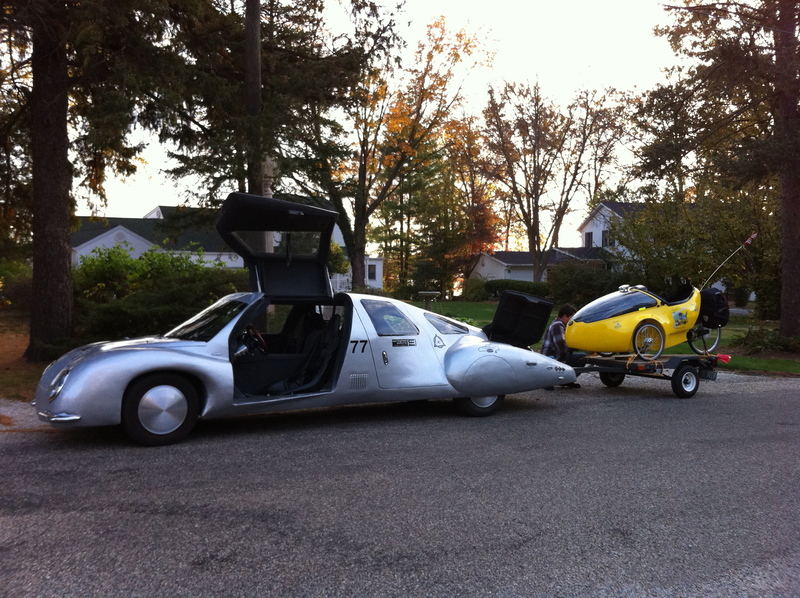 “Seven” gets 200 miles on a single charge (twice the range of the much-touted Tesla), and I’m happy to report successfully transported 3 adults, a rocket trike, and a trailer 100+ miles to Champaign. This is likely a world record, as none of us has ever heard of an electric car accomplishing such a feat. Whoever thinks electric cars lack for power just needs to ride in one. To demonstrate, Kevin peeled rubber as we headed down the road. In Champaign, we met up with Matt Childress, who had arranged for our electric vehicles to be displayed on campus as part of University of Illinois’ Sustainability Week. He drove me to campus in his two-seated, fully-electric bike called the TWIKE. Ended the day by riding around the beautiful campus quad before heading back to Matt’s house to join his family and friends for dinner, where we schemed on ways to mainstream the electric vehicle market. This entry was posted in 2010 Ride, Articles, Blog, Video and tagged champaign, daily illini, illuminati motor works, progressive insurance, ride for renewables, sustainability week, university of illinois, wcia2, wicd15, will, wpgu, x prize. Bookmark the permalink. Love it! What a sight.